When Europeans showed up in Bennington in 1777, the townsfolk didn't exactly receive them with open arms. In fact, the town is perhaps best known for the revolutionary battle that bears its name, which ended with 207 Brits and Hessian mercenaries dead, and 700 captured. 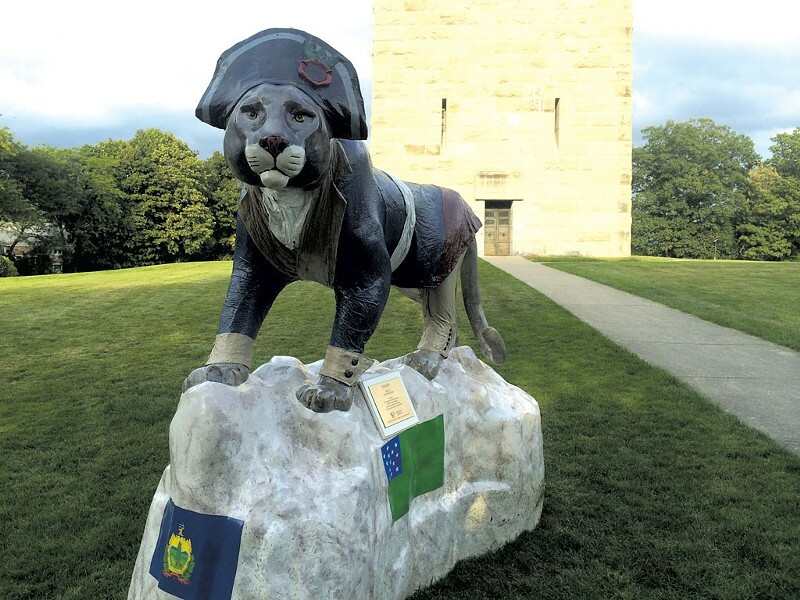 Vermont's tallest manmade structure, the 306-foot Bennington Battle Monument, looms over the town, memorializing that conflict. As the centuries passed, Bennington remained a quintessentially American burg, seldom recognized for any form of Euro-fanciness. But in the past decade, the Continent has been creeping back into this stalwart Yankee territory by infiltrating its dining scene. Some traces of the invasion are subtle. The downtown Village Chocolate Shoppe sells not just folksy chocolate moose "turds," but also gelato and dark chocolate flavored with Umbrian olive oil infused with peperoncino, lemon or orange. Bennington's Asian fare is still limited to a Chinese buffet and a small selection of Japanese candy available at the Gamers Grotto on Main Street. But over the past decade, European-style restaurants have been steadily popping up. Chef Bill Scully broke the ice in 2002 when he opened Pangaea, Bennington's first international restaurant and perhaps still the biggest name in southeasternmost Vermont dining for those who choose not to cross the border into nearby New York or Massachussetts. The Euro specialties kept coming to Bennington, and not just the Mediterranean and Alpine eateries that dot most Vermont towns. Bakkerij Krijnen, Vermont's only Dutch bakery, debuted in 2004. Scully and partners opened a relaxed Italian bistro, Allegro Ristorante, in 2007. A year later, an Englishman opened a fish-and-chip shop, while 2009 saw the advent of Crazy Russian Girls Neighborhood Bakery, known for its Russian rye bread, pastries and Friday "peasant" lunches featuring pierogi, borscht and sauerkraut. Seems that the freedoms for which the Green Mountain Boys fought include the freedom to sample tastes not widely available elsewhere in the Vermont Republic. On a recent weekend, I did just that, stuffing myself with fried, sugary or cheesy treats all over Bennington. Between stops, I visited the Bennington Museum and walked through the town's old cemetery, where I visited the Revolutionary dead and Robert Frost. Frost's epitaph boasts, "I had a lover's quarrel with the world." By the end of the tour, so did my stomach. But it was worth it. Some towns have an under-the-radar official foodstuff: Bennington was once dominated by fish-fry spots, much as Barre is by mostaccioli. So it's only natural that English fish and chips went down easily when Lil' Britain opened in 2008. In 2012, original Brit owner Kevin Wright and his wife, Sarah, had a baby and decided to sell the business. His American pals Nathan and Beth Johnson took over. How do Americans go about running an authentic British chip shop? "I am holding steadfast to everything I learned from Kevin and what he taught me when we took over," Nathan Johnson says. "We really didn't change a whole lot." 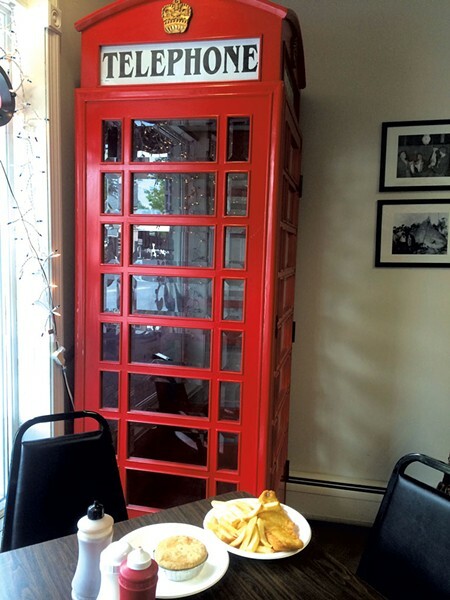 A red English phone booth still holds a place of honor in one corner. A sign near the entrance reminds guests of the "health benefits" of fish and chips, including "proteins to build muscles, and vitamins and minerals to keep you healthy..."
In truth, the Johnsons' version of the staple does feel more virtuous than most. The batter is so light, you can imagine it floating, balloon-like, out of your mouth. The fish and the crisp, stubby chips offer not a hint of grease. Since the price of fish and chips ($8.75 for a sizable "small") includes a side, it would be blasphemous not to order the mushy peas. They're basically pablum, but a comforting necessity. To balance the bland, ask for curry sauce on the side. The sweet, tangy sauce enlivens the chips with a fierce taste of the colonies. Small but filling pies include chicken-and-mushroom and steak-and-kidney. The latter is flaky and stuffed with offal. A sausage roll takes longer to cook, but the treat of puff pastry filled with a big, subtly spiced banger is worth the 25-minute wait. Nathan says that a surprising number of local Brits come in for food and the retail goods he sells, including candy, malt vinegar and Lyle's Black Treacle. But the biggest hit on his menu this summer was a seasonal special: fish tacos, made from scratch with homemade salsa. Perhaps even the English need some spice sometimes. Unless you've got a Dutch mother, you'll find only one place in Vermont to stock up on bokkepootjes, stroopwafel and gevulde koeken. Pastry chef Hans Krijnen arrived in Bennington in 1989 and married Jennifer, a server he met while cooking at the town's Four Chimneys Inn & Restaurant. The pair opened a wholesale bakery in 2004, but closed a year later when Jennifer developed hyperthyroidism. While his wife underwent treatment, Hans Krijnen studied at the Institute for Integrative Nutrition and became a certified health coach. "It totally changed the way he looks at food and prepares food," says Jennifer. And he was ready, once again, to offer the community his popular bread and sweets — with a few twists. In 2010, the couple reopened the business in its original spot, a large house in a residential area. Where Hans had previously used margarine in his pastries, now he chooses ingredients that are organic and, whenever possible, local. Since the couple's daughter has a dairy allergy, many items are also vegan, including the daily soup. The bakery's crusty, naturally leavened breads and Cuban black-bean soup may be healthy, but, as Jennifer puts it, her husband is "trained in the European tradition of butter, butter and more butter." His classic stroopwafel is two skinny waffle cookies filled with syrup made from treacle-like stroop. The dense, almond-flavored spice cake, gevulde speculaas, is so indulgent that Jennifer recommends cutting an already small cube into six servings. 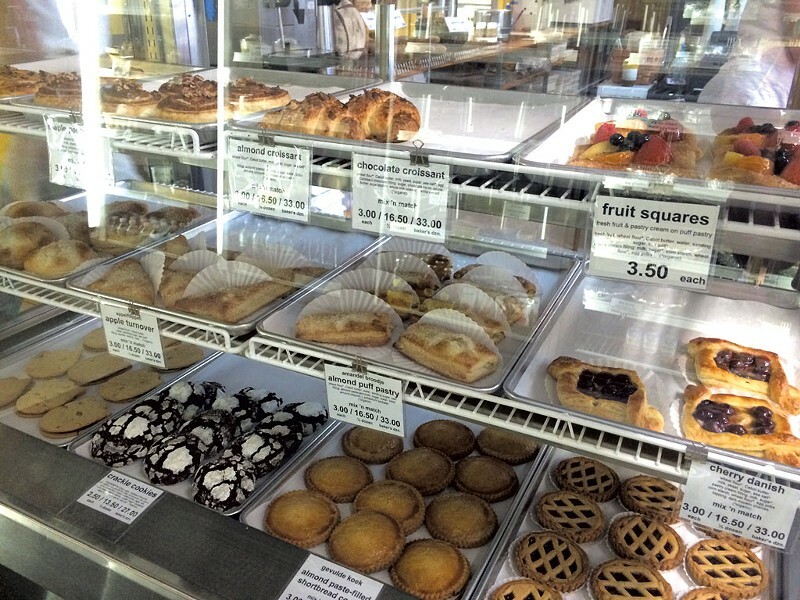 As one of the area's few Dutch bakeries, Bakkerij Krijnen attracts guests from all over New England. After the business received an editors' choice award from Yankee Magazine this year, natives of Holland started making pilgrimages there from as far as Boston and Connecticut. Jennifer says locals from Russia, Poland, France and even Israel likewise flock to the bakery for marzipan-heavy treats that remind them of home. "When we opened, there was a brewpub down the street, an Irish bar, a little diner and a lot of pizza places," recalls Anna Sturges of the early days of Allegro Ristorante, which she co-owns with her husband, executive chef Geoffrey Klose, and Bill Scully and his wife. She acknowledges Bennington hasn't seen a sea change since then: "That's pretty similar to how it is now." But, like the other eateries profiled here, Allegro has risen above the low-brow status quo of Bennington dining, offering modern Vermont takes on rustic Italian cuisine. Burlingtonians might view the restaurant as a Trattoria Delia south, complete with a dark, romantic ambience, creative homemade pasta and ultra-local ingredients. In a town where an intense local focus is still uncommon, Klose and Sturges source from tiny growers based nearby. Northern Vermont restaurateurs may brag about using Maplebrook Farm's exquisite mozzarella and burrata, but Allegro's owners can say that those curds traveled less than two miles from farm to kitchen. "People make the jokes about how it's so 'Portlandia,'" Sturges says. "'Do you know the farmer's name who grew this rabbit?' Actually, I do. They live in our community, and I know them personally." She's talking about Bruce Marchegiani, who owns Wanabea Farm in Manchester Center. 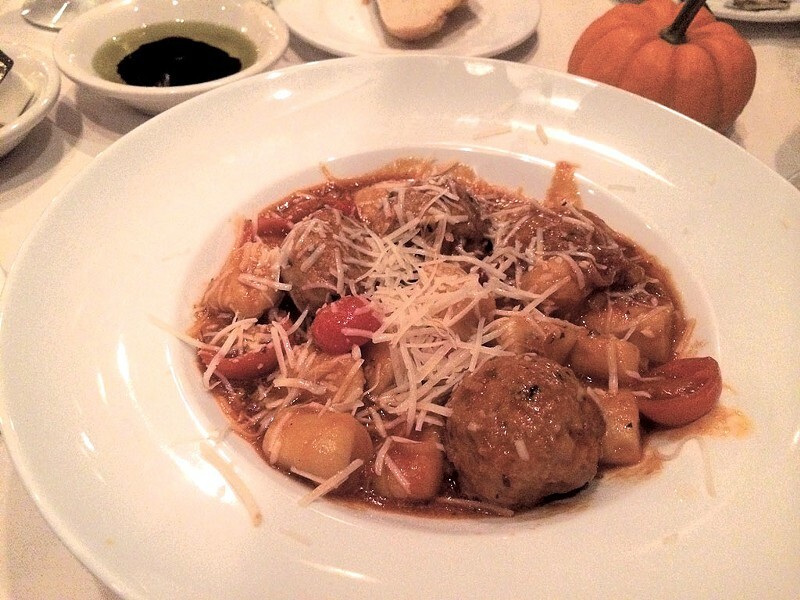 Allegro's chefs combine his rabbit with Maplebrook ricotta in an ultra-light meatball, then serve it over potato gnocchi and explosively fresh cherry tomatoes in a sauce speckled with caramelized leeks. At $10, the appetizer is big enough for a meal — a creative, memorable one. The same can be said for Allegro's $7 gnocchi alla carbonara. Chefs hope to earn descriptors such as "pillowy" or "cloudlike" for their gnocchi, but these dumplings, made of soft pastry dough speckled with fresh oregano, reside beyond that in the realm of "melting." Served with peas in a cream sauce flavored with smoky bacon, they offer a taste of what Bennington's food can and deserves to be. The original print version of this article was headlined "Bite of Bennington"